Well-Designed, Fine Workmanship: Made of acrylic material for a glass-like look and feel. The ice cube color makes it ultra elegance and cool. Exceptional Performance: The mini laptop USB speakers deliver powerful sound for your computer, PC, Echo Dot, monitor, smartphone. Blue LED Light, Simple Operation: Shine blue light while play music via pluging into USB port. USB connectivity is super simple. Small computer speakers have an AUX jack to plug in a MiniDisc player, MP3 player, iPod, cellphone and any other AUX jack-equipped mobile media players. One Knob Volume Adjustment: This laptop external speakers provide you a more enjoyable audio experience. One knob control is for adjusting the high/low volume super easily. 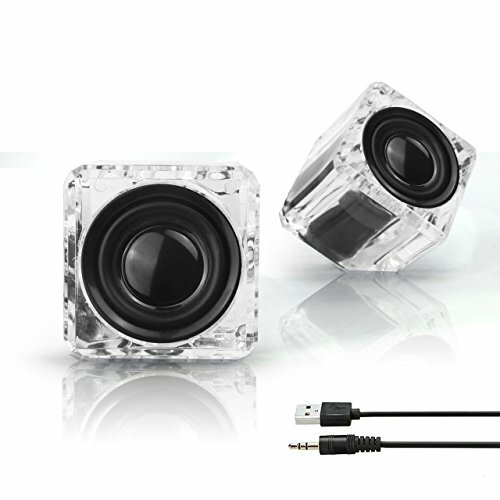 Portable Take the USB PC Speaker Outside: 2*2*2 inches, 3W*2 speakers, small size with powerful, rich and clear sound. Contact us if you are not satisfied with it for any reason. We'll process full refund or send you a replacement without returning or any additional conditions. If you have any questions about this product by BetterLife88, contact us by completing and submitting the form below. If you are looking for a specif part number, please include it with your message.